Is there still a gap between the ability of AI marketing solutions to execute on real-time B2C marketing campaigns, and the readiness of marketers and business leaders to adopt them? 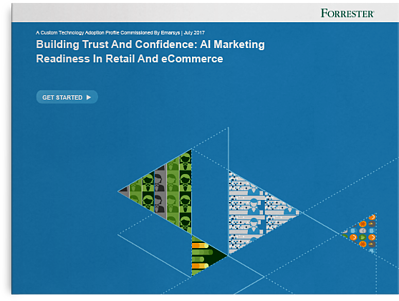 Download this commissioned study, conducted by Forrester Consulting on behalf of Emarsys, to learn more about AI marketing readiness in retail and e-commerce! Only 52% of retailers said they're able to manage real-time customer interactions. 86% believe that AI will allow marketing to become more efficient & effective. 78% said their spend on AI marketing technologies will increase by at least 5% over the next 12 months. "88% of those polled strongly agree that AI marketing will reinvent the retail industry"